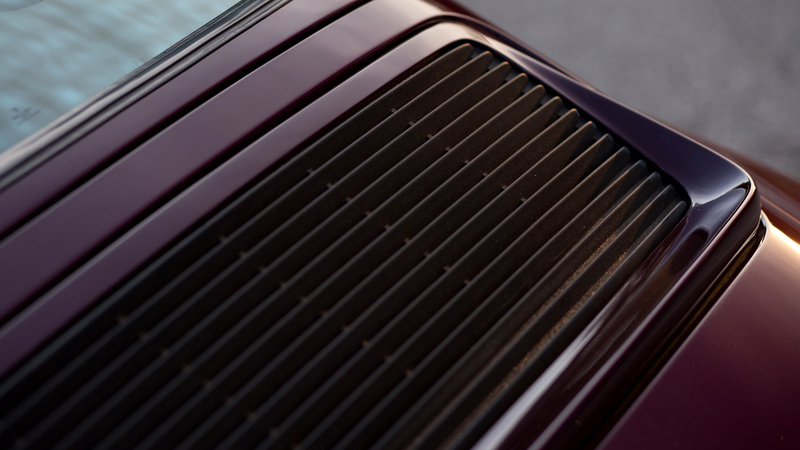 It's undeniable that Porsche's 964 is 2014's go-to car. 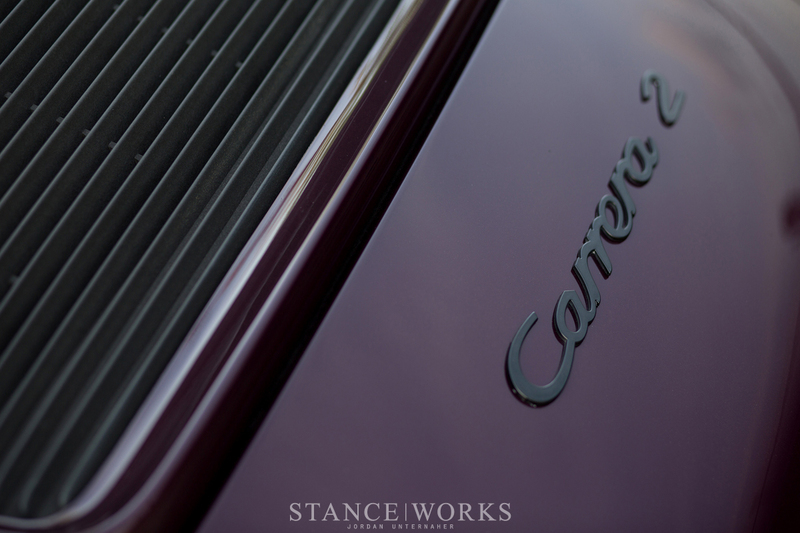 We've seen several jaw-dropping examples here on the pages of StanceWorks alone, and we've only scratched the surface - the 964 has found itself as the chassis of choice for many of the year's best looking builds, all emphasizing a return to cleanliness, modesty, and continuity. Where we once found competitions to be the lowest, widest, or best, we've seen a hand full of die-hard enthusiasts find the car of their dreams, and instead, build the car they pictured on their wall as a kid. Andrew Farkas's story fits right in, taking us all the way back to his childhood where the best stories of man and machine begin. Andrew, like many, credits his love and enthusiasm for cars to his father and the MG Midget they spent summers working on in his youth. "We still look back at photos from all the car shows he had taken that thing to, where me and my brother were sitting in the passenger seat and really small back seat," Andrew recalls. He spent much of his childhood eager to help his father turn wrenches, only in hopes of learning something new about the car with each repair and change. With the dream every gearhead has of passing his knowledge on to his son, Andrew's father was just as enthusiastic about teaching his craft and purveying automotive passion. With the help of his old man, Andrew had already bought and sold three cars before he had acquired his driver's license at 16. One cheap fix-er-upper after another, the two bought, repaired, cleaned, then sold cars, turning a couple hundred dollars into a couple thousand time and time again. When the right car worth keeping finally turned up, Andrew was ready, cash in hand, eager to get his hands on Toyota's AE86 Corolla. Andrew admits that he's a Toyota guy at heart. "I even have the original Toyota logo tattooed on my right wrist." He held on to the AE86 for more than a decade, learning more than fathomable about the brand, the car, and its inner workings. "It is those 12 years that got me exactly where I am now." To be fair, those 12 years are telling; the AE86 went through a number of changes and stages, with Andrew insisting the list goes from head to toe. "Rebuilding, refurbishing, replacing old parts... you name it. I learned a lot of stuff from that car." Any definition of the word "refurbishing" that includes a high-strung 16v inline-four with 304 cams, weber carbs, and high compression pistons is my kind of refurbishing. It was obvious that Andrew had had his fun with the car, and despite its original $1800 purchase price, Andrew coyly admits that he had a fortune into it by the time it was "done." After loosely "finishing" the Toyota, he found his way into the world of Volkswagens, including time spent with a 337, an R32, and a few MK3s. The MK3s earned him attention on the pages of Performance Volkswagen Magazine and more - Andrew was having little trouble finding his way into the world of the Automotive Aftermarket. However, it wasn't until 2012, after his father's purchase of a Porsche 996, that the thought of P-car ownership had crossed his mind. 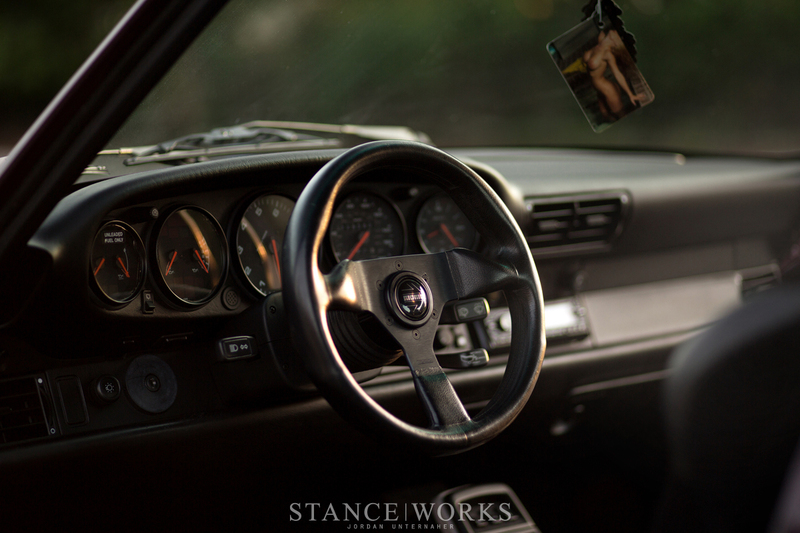 After getting behind the wheel of his old man's car, Andrew defines the need as "instant." The search began the following day as he scoured Craigslist, Auto Trader, and various forums, hoping to find the "right" car. He was in a position to buy something nice, but was unwilling to stretch himself too thin, which meant holding out for the perfect deal. There are two types of car buyers: if you're like me, money burns a hole in your pocket, and when a car pops up on Craigslist with the right options, it's a mountainous up-hill fight not to blow your money then and there. On the other hand, there are people like Andrew, instilled with patience. It was nearly a year before Andrew and the right car crossed paths. "When I came across the car on Craigslist, I actually figured it might be a scam since the title had a mileage typo, and the price seemed far too cheap. I gave the guy a call for shits and giggles since he left his number in the ad and believe it or not, he was a legitimate seller." After seeing the car in person, Andrew had a good feeling: everything on the car was just as described, and the surprisingly low price was followed with a story. "The gentleman was retired airforce and had actually purchased the car from his son-in-law a year prior for a really good deal, and he was simply passing on the good deal to come out even." All of the car's paperwork was present, with receipts and records dating back to new. Best of all, the records showed a recent top-end reseal at 100,000 miles, and only 4,000 miles added on since. In lieu of the community's insistence of a pre-purchase inspection, Andrew threw caution to the wind, and bought the car then and there. With no leaks, no noises, and no broken accessories, Andrew was confident, but he had to be. The seller informed Andrew that, due to his low price, interest in the car was through-the-roof. Andrew's normal practice of "sleeping on it" for a night or two before pulling the trigger wasn't going to fly. A potential buyer in New York was ready to wire money over if Andrew walked. Knowing that the wait for such car once more was sure to be long and arduous, he caved. "Fine, I'll take it." With that, in November, 2013, Andrew purchased his very first Porsche. After bringing the car home, Andrew listed the rest of his fleet for sale, including his beloved AE86, his recently purchased 1980 Corolla wagon, and his VR MK3 show car. "It was a bitter sweet moment, because I now own such an incredible piece of machinery, but I had to let go of a car I loved for many many years, and two others I really enjoyed." It's a necessary sacrifice many of us are all too familiar with, but one that heeds way, most often, to new joys and experiences. With the cars sold, it wasn't long before Andrew was making real progress on the car. Beginning with the obvious, Andrew ordered suspension through Brian at Rotiform, who is the dealer of a specialized line of H&R coilovers. Chasing after an inspiring Maritime Blue 930, Andrew was eager to run BBS E26s, which Brian also had a lead on. Set on running 17s instead of 18s, it was a perfect fit, with the sizes tallying in at 17x8.75 for the front and 17x10.5 for the rear. When it came to the car's "linen white" interior, Andrew was a bit less than fond of it. After learning that the Amethyst Purple over Linen was a desirable combination, he felt compelled to keep it, but he knew it needed a few changes. 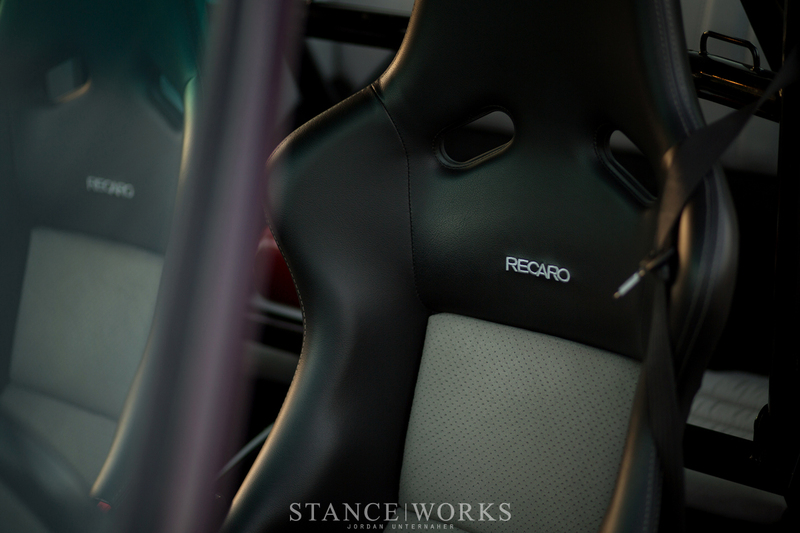 A friend stumbled across a set of Recaro Pole Positions in black leather with light grey suede inserts and white stitching - a perfect match for the unique innards of the porker. 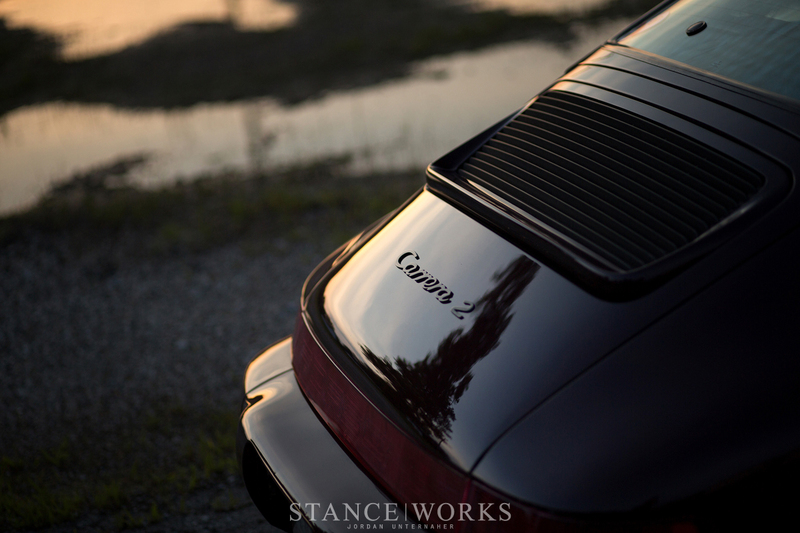 A used half-cage was sourced from Rennlist and a a Momo Monte Carlo was fitted, all in line with preserving the 911 sports car mentality. An ACCELL Racing 93-octane chip gives a little life to the engine, but Andrew has higher hopes in the long run: "If I happen to come across some money in the future maybe I'll consider a nice set of cams and ITBs." For now, however, the car stays as-is. The car could use a re-spray, but its current condition ensures that Andrew isn't afraid to drive it. A few tidbits inside could use replacing, but the car wears its age well. 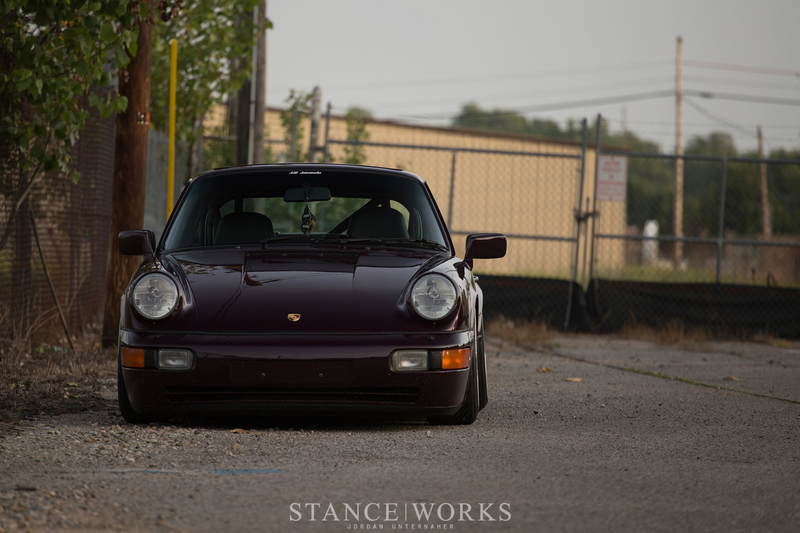 "My vision of a 964 had all come together in such a short period of time and I couldn't have been happier. Everything tied together just how I imagined and it was simply perfect," Andrew tells me. "I wanted the body to remain original, but I wanted to add motorsport touches here and there for a really clean execution. I've never been one for really over-the-top modifications and I have always preferred things very simple and clean in terms of modifying a car. I think the Porsche's classic lines and styling really go best with a motorsport look and anything more would only ruin it in my eyes." Andrew puts it simply: he's happy to be driving the Porsche he always envisioned. The car could use a respray? That paint looks immaculate for its age! To go from VW’s to Porsche is anything but traitorous. The front wheels look goofy.